Chorley have secured the signature of former Manchester City youth player and ex-Carlisle United player Courtney Meppen-Walter. 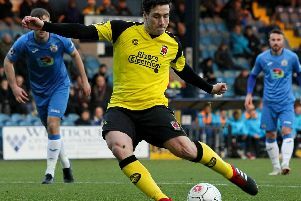 Defender Meppen-Walter left League Two club Carlisle after a two year stint just before Christmas because of a lack of first team action and had been at Ashton United before deciding to move to Victory Park today. The 21-year-old defender represented England at U-17 and U-18 level and goes straight into the squad for tonight’s game at Gloucester City. Magpies boss Matt Jansen’s ex-Blackburn Rovers team mate David Dunn tried to sign Meppen-Walter when he was boss at Oldham Athletic earlier this season after the six foot three defender left Carlisle by mutual consent. The versatile defender played 34 times and scored twice for Jansen’s old club Carlisle and could fill the hole left by full-back Andy Bond who signed for Crawley Town earlier this month. With full-back Will Beesley facing a three week lay-off and defender Keil O’Brien only re-signed on a 28-day loan from Bury due to a knee problem, Meppen-Walter’s arrival is a much needed boost to Jansen’s defence.